Doll cakes are making a comeback. Really. I haven’t had a request for one in 4 years, but have made 3 in the past month… Crazy! This most recent one was for a darling little girl who just turned 3. I remember my mom getting me a doll cake for my 5th (I think?) birthday. I’m pretty sure she didn’t make it and, when I laid eyes on it, I thought it was the most wonderful, glorious thing I’d ever seen in my life (wish I had a picture). It was covered in thick pink and purple icing and, up until that point, was the most treasured thing I’d ever received for a birthday (until I got my horse, Cactus, when I turned 10). Because I raised such a fuss when it came time to cut (i.e., “destroy”) it, my dear mother only cut cake out of the back of the dress to preserve it as long as possible….I recall we kept it for waaayyyy too long (it got pretty stale so my mom eventually threw the uneaten cake away). This was a 4-layer vanilla cake (9″-8″-7″-6″ rounds) with blue vanilla-bean buttercream between the layers. After carving, I iced on a thin crumb coat, inserted Elsa, and popped the entire cake into the fridge to firm up. The blue rosettes (tinged with white) were piped on with a Wilton 1M tip and the ruffles around the bodice were piped with a 104 tip. I added small snowflakes cut with my punch cutters and crystal sugar flakes to add the illusion of snow. I also made a dozen chocolate cupcakes with blue rosettes and adorned each with a single fondant snowflake. A fondant inscription was added to the cake board. So fun to make and brought back many happy memories of my own childhood. Happy Birthday, Claire! 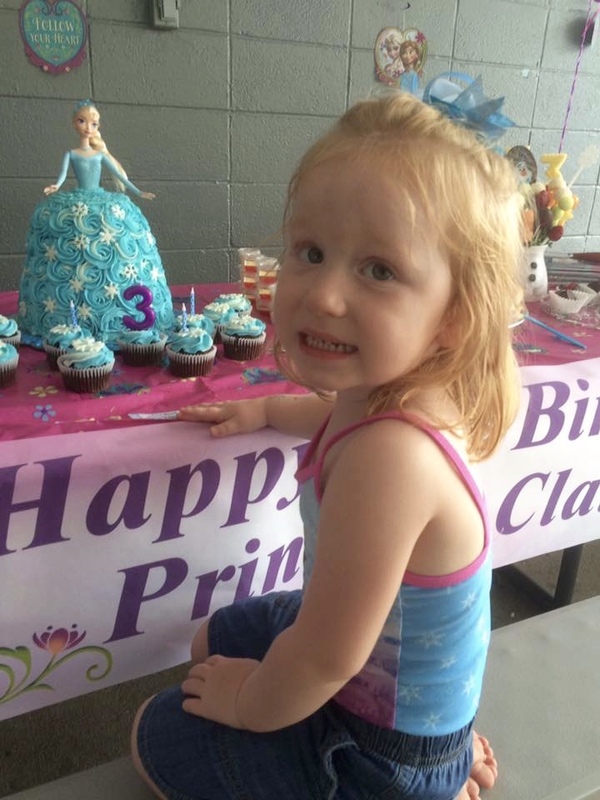 I so much enjoyed making your Elsa doll cake and cupcakes! Tasted every bit as fabulous as it looked! Terrific!! Thanks so much, Christine!! Nice! I’m so glad they’re coming back- they’re cute and they have a toy inside !